This year we participated at Terranea Festival, where we supported festival with two twitter walls using our systems’ InformAsYouWish Social Signage plugin. 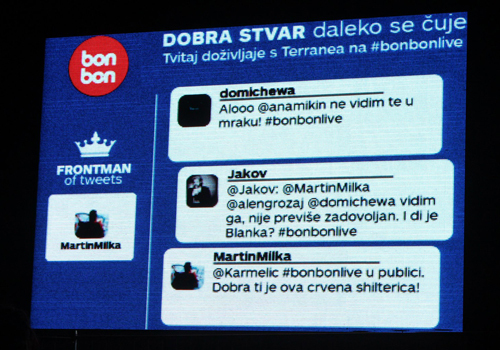 There were two Twitter walls sponsored by Bonbon, at the festival – one next to the main stage and the other next to the Bonbon bar. Walls became very popular among visitors of the festival, there were about 1,000 tweets per night , the largest part was shown on the screen next to the main stage. This way of brand communication with (potential) customers is becoming increasingly popular.